Winter is quickly creeping in, and at this time of year we all feel the need to hibernate like the animals our children learn about at school; in fact, with darker nights and colder days, having a house that’s warm and cosy is imperative to creating a feeling of “home sweet home”. There’s nothing less homely than being in a house that is cold and drafty, yet, there’s nothing more comforting than a warm and cosy bedroom that makes you feel all safe and snuggled up from the cold weather outside. Indeed, winter can be a magical time, for as the snow begins to fall for the first time, the whole house will get excited about the prospect of building snowmen, going sledding and having the inevitable snowball fight. Of course, there’s the occasional Scrooge like character that fails to see the magic of this time of year and considers only the affect such adverse weather will have on traffic conditions… but for most people, and in particular, most children – the snow starting to fall signifies a time of magic and wonderment. There’s nothing better, as a kid, than being wrapped up warm looking out at the snow falling from your bedroom; going to sleep, then waking up every now and then, peeking through the window to see if it’s still snowing and whether the snow has settled. Now, in terms of making your child’s bedroom warm and cosy, the furniture in your kids bedroom is quite important. Cuckooland offer perhaps the coolest kids bedroom furniture to create a modern yet cosy atmosphere, though, a lot of making your kids bedroom more warm and cosy comes down to is related specifically to their bed and lighting. Lighting is one of the most vital components when it comes to creating a warm and cosy space, and there are a number of things you can do to add to the feeling of warmth within your child’s bedroom, whilst also offering a safe “night light” glow that is conducive to sleep. Many times, people put warm LED string lights into their child’s bedroom to emit a warm glow that is safe to stay on throughout the night (particularly if battery operated), whilst if you’re looking for something a little more fancy you could use a Himalayan salt lamp, as this will create a cosy glow in addition to providing numerous health benefits. Then, when it comes to the warmth and coziness of your kid’s bed, it can be helpful to add a memory foam mattress topper to their bed, as this will provide much warmth and insulation whilst also making the bed feel more cloud like in that they will sink into it. If your house is particularly cold, and electric blanket can work wonders in providing a constant supply of localised heat – or a hot water bottle provides a more specific heat source that can be nice to put in the bed prior to bedtime. When Father papered the parlour you couldn’t see him for paste, Dabbing it here dabbing it there, paste and paper everywhere. Mother was stuck to the ceiling, the kids were stuck to the floor, I’ve never seen a bloomin’ family so stuck up before. Well… we did some decorating last week. It was just one wall in my eldest daughter’s bedroom, but honestly, I’ve never seen a family make such a dog’s dinner of a simple task before. I’m no stranger to papering, I’ve done it loads of times in the paste, I learnt from my Mum. Graham is also pretty used to it, although it’s not his favourite job. So, why did it all go so horribly wrong. There was paper put on the wall upside down, paste spilled on the floor and tempers fraying. And I’m sore to admit, it was mostly my fault. The end result was disastrous and my poor daughter came home to a wrecked bedroom wall. Thankfully, Graham rescued it the following day and all was well, but I have decided that I need to accept my limitations and let the others get on with jobs like this in the future. Thankfully, it was just one bad day last week, the rest was fairly uneventful, nice even. Okay, I spent a day in hospital having my IVIG but that’s not bad, I can think of worse thing to do than sit back in a fully reclining chair with my earphones and a good audio book. There is even tea and biscuits, and sandwiches if you are there at lunchtime. I was on a different room on the ward this week and actually had a partial view from my window. The best part was not having any side effects from my treatment! Eldest daughter has had a friend visit from Germany which was nice. When you are a family of seven you think the house is pretty crowded enough already without other’s coming to stay, but it’s nice to change the dynamics a little. Eldest daughter has been happier, eldest son has been making an effort (i.e. not hiding in his room all day and he even did some jobs for me to make the house look tidier before she arrived,) and even Boo was trying to impress her. I have had a lot to do in last week, bills to sort out, forms to fill in, telephone calls to make, blog posts to write etc etc. At times I felt overwhelmed and my to do list was getting longer and longer with not much ticked off. Then suddenly, I’d somehow managed to do it all! I know, I was astonished that it had all just fell into place. As soon as I stopped procrastinating I suddenly realised that I could do it and I did. I’ve even managed to fit in a little crochet and book listening. I’m currently listening to ‘A Discovery of Witches‘ and really enjoying it. Although, it is over 24 hours of listening which is a lot longer than the books I usually choose. I used to love baking and decorating cakes, but now it looks like Boo has taken over my job. She was determined to do the decoration for her own cake so I let her. First she made the fondant rabbit. I asked her if she wanted help and even gave her a step by step guide, but she preferred to do everything herself. I baked and iced the cake but left everything else to her. The only thing I had to help her with was the grass, I showed her my clever little trick with a sieve. I wanted to pipe her name on as I know this can be tricky, but she wasn’t having any of it, I think she did a good job. Boo turned 11 on Friday and we didn’t have a party. To make the day special we invited her best friend to tea and let Boo help with the shopping. They ended up with Fake KFC drummers and chicken strips, pizza, mini sausage rolls and mini cheese and onion rolls. For afterwards there was macarons, party ring biscuits, mini angel cakes and, of course, birthday cake. We lit her candles on the cake and her friend carried it in to her while we all sang Happy Birthday to her. They then played in the garden in the sunshine before it was time for her friend to go home. I didn’t make a video of Boo decorating her cake, but here’s one we did last year of her decorating a Valentines cake. She definitely has a talent. After a busy week last week I don’t seem to have much planned this week. I guess I’ll have to focus on my crafting. I’ve not made any new cards yet but I’ve been working on a drawing that I’d like to include on one I need for next month. I really want to practice with my die cut fairies though, I’d love to create a fantasy scene. I have started on a new blanket, it consists of many diamonds that will all have to be sewn together. I’m not keen on the sewing bit so wish me luck. My CAL blanket also consists of many pieces that will have to be joined together, but that won’t be until next year! I also have to make another soft toy. I want to make a start on the family bathroom this week, I’ll be able to do some myself but I’ll need the help of Graham to get most of it done, and he’s not keen on decorating. There isn’t really that much painting to do but the door and skirting board need doing and I get headaches when using gloss paint. I also want to paint the hand rail on the stairs, but as I need it to get up and down it’s difficult to find the time to do it. I guess I could paint it myself but I’d have to start at the top and work my way down. If I’m honest I don’t know how safe I would be. It’s so frustrating not to be able to do these jobs, they are not the jobs I would have shied away from before I was sick. I remember painting the living room ceiling when I was heavily pregnant with Star, and I loved paper hanging. Do you like decorating or do you leave it all to someone else? We stayed in on Saturday because I really wanted to watch the Royal Wedding. I made sure I’d done everything before hand so I wouldn’t be disturbed, and I even put a frock on. We didn’t have any banners or flags though. I watched it on television with Star and my eldest son, no-one else was interested. On Sunday I asked the kids if they’d like to go out somewhere or if they’d like Daddy to put up the trampoline (which we’ve had since last December!) They opted for the trampoline and the girls have loved it. We have to limit Star’s time bouncing because of her condition, but she’s really good at limiting herself. Sadly though, the Little Man started experiencing back pain shortly after his first bouncing session. He said he didn’t fall and the pain just started. It’s been 48 hours now and he still feels it when he goes on the trampoline, but otherwise he is okay. It’s very strange, and very sad. I hope it passes. What worries me is that he is now at the age that Star was when she had problems with her neck. I hope he doesn’t have spinal problems too, but maybe I’m just overthinking it. I’m going to book him an appointment with the GP for after school tomorrow just in case he’s done any damage. We spend a lot of time in the kitchen and it’s often the hub of the home. Whether you kitchen is big or small, trendy or old fashioned it’s always nice to find ways to make the area brighter and more cheerful. Here are my five tips to brighten up your kitchen. Okay, it might be fashionable to have startling white kitchens these days, although personally I’m not a fan. My kitchen gets way to messy to cope with all white! My kitchen is fairly old fashioned with wooden cupboard doors and black worktops. But whether you like your kitchen stark white or not a touch of colour always brightens things up. I love this worktop saver from Red Candy. I have plenty of chopping boards but I wanted something to protect my worktop where I make my tea and coffee. This saver is perfect and the colour and style is a big hit with my family. My old kitchen was really small and the only place I had pictures would be stuck on my fridge door. Now, I have plenty of wall space and I like to add pictures to break it up. 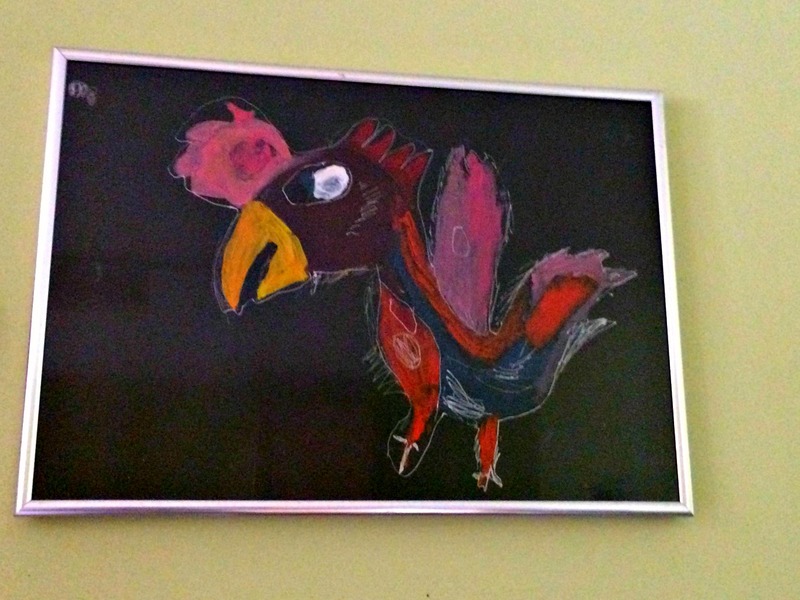 In the dining area I have a board where I pin the kids pictures but in my kitchen I have a few pictures, including a foodie style print, a photo collage and this lovely original piece by my daughter Star which she did when she was 9 yrs old. The draining board is officially the most dreaded place in the kitchen. Who likes washing up? Of course having a gorgeous drainer like this one from Red Candy will brighten up your sink area and make washing up more bearable. Over the years I’ve had all sorts of flooring in my kitchen from, tiles, to vinyl, wood to carpet. I have to admit, my feet are always more accustomed to a carpet beneath my feet but this is not always practical in the kitchen. So how about adding a rug! In fact Red Candy have plenty of funky, good looking and even practical items for every room in the home. In what ways do you brighten up your kitchen, do you like a splash of colour? Disclosure: I was sent some items from Red Candy for the purpose of this post. All thoughts and opinions are my own.